Weather seems to have settled down to average this weekend, giving us a relief though it is still pretty cold. Unlike last few weekends, we had sunshine with less wind this weekend in Tokyo which you could find many washing hanging out on the balconies of the apartments. Today’s seasonal phrase is about the fog or mist that we start to see around this time of the year. The first noun ‘Kasumi’ is a Japanese for a fog which is one of the weather condition we see in spring used as literary expression, not defined meteorologically. There is another Japanese, ‘kiri’, which is used literary only for a fog in autumn and a Japanese meteorology word for such phenomenon. ‘Kasumi’ and ‘kiri’ are both the same weather condition, only with the difference of when they appear. There are several ways of how fogs are formed but ‘Kasumi’ is a fog that is formed by the rise in the atmospheric temperature due to the seasonal prevailing westerlies at this time of the year. ‘Kasumi’ also means the haze that is formed by the dust blown into the air from the Yellow River region in China which could be seen more in the western parts of Japan from this time of the season. 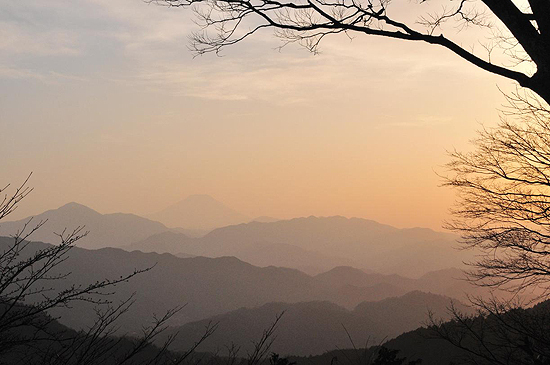 ‘Kasumi’ over the mountains along to Mt. Fuji. Photo from ‘Work out, Baron’s zaregoto‘. The next word, ‘hajimete’ is an adverb meaning for the first time followed by a verb, ‘tanabiku’, telling us that the ‘Kasumi’ is trailing or hanging over. Therefore, the whole meaning of the phrase would be, “The fog in spring starts to hang over (the hills and fields)”, telling us that we can tell that spring is here by the vision we see outside now. Mysterious and romantic ‘oboro duki-yo’. Photo from ‘Daily Photo by GON‘. Finally, the ‘Kasumi’ usually disappears no later before dark. Still, there are nights at this time of the year when fog remains after dark or newly fog appear during early night. 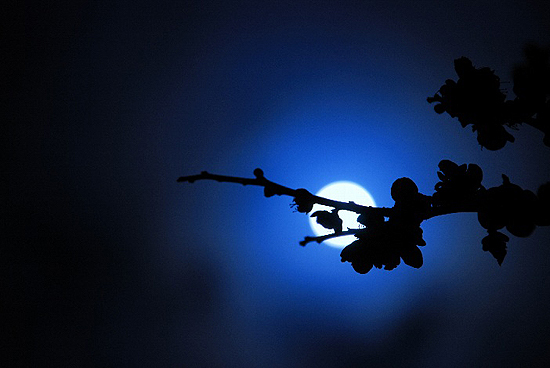 The ‘Kasumi’ at night which is read with moon light in classical Japanese poetries is called ‘oboro’ and is described as ‘oboro duki-yo’ meaning night with hazy moon which is a season word of spring night. ‘Oboro duki-yo’ is also a name of a beauty which appears in the The Tale of GenjiW written by Murasaki ShikibuW whose sudden romance which started at a hazy moon night between Hikaru GenjiW. It was her who became the cause of Hikaru’s relegation to Suma…. 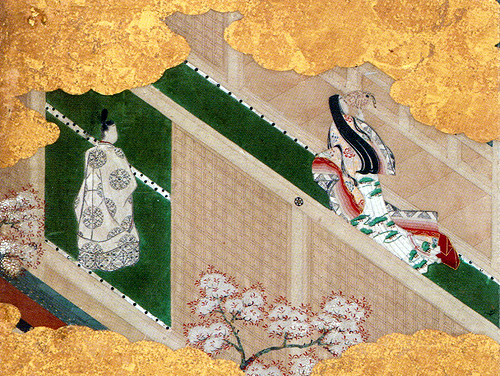 Painting of ‘Tale of Genji’ on folding screen of Momoyama periodW, showing a famous scene of Hikaru and Oboro duki-yo’s rendezvous. 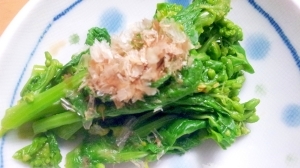 Japanese rapeseedW has long been one of the important vegetables in Japan from Yayoi periodW. It is thought to have been brought into Japan with the agricultural culture from China and has been written in KojikiW, the oldest extant chronicle, and ManyoshuW, the oldest anthology of poems in Japan. Rapeseed blossom and honeybee. A typical scene of spring in Japanese countryside. It was in Edo periodW that rapeseed in Japan was used as oil expression. The canolaW was used mainly as kerosene which the cultivation spread wide all over Japan as the rapeseed was strong and easy to cultivate. The yellow flower of the Japanese rapeseed cultivated in fields has been a common feature in spring of Japan, read and described in poetries, novels and other arts, as well as typical spring dish. 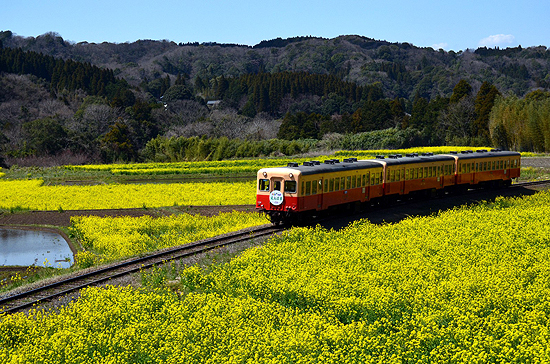 Kominato LineW of Kominato Railway running through rapeseed fields of Chiba prefectureW. It was after Meiji periodW that the Japanese rapeseed was taken by the rapeseed which is grown a lot outside Japan when Japan solved the national seclusion. 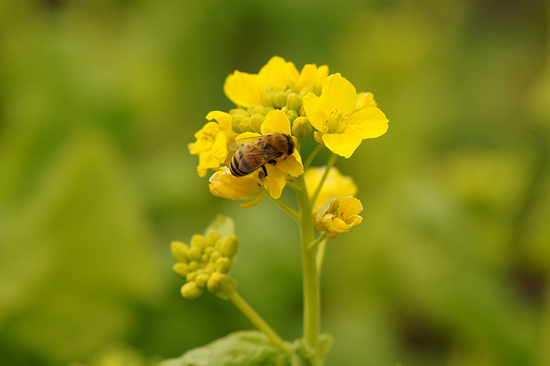 There are movements of Japanese rapeseed variety protection but since rapeseed crossbreed is easy, it is next to impossible undertaking for those who are trying hard to keep the species preservation. The rapeseed blossom is sold when in bud for cooking. It is a vegetable that you find in supermarkets from New Year, made in hothouses, to mid March as a spring reminder. Flowers in bloom could be used in flower arrangements together with peach blossoms in Girls’ Festival on 3rd March.